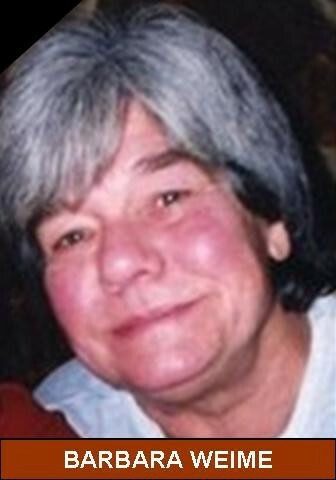 MOLINE -- Barbara Jeanne Gunn, Moline, died Monday, March 7, 2005, at her home with her family at her side. Visitation is 4-7 p.m. Wednesday at Van Hoe Funeral Home, East Moline. Following visitation her body will be cremated and the family will have a private committal at Outer Banks, North Carolina. Memorials may be made to Living Lands and Waters. Barb was born January 24, 1944, in Moline, the daughter of John and Barbara (Black) Weime. She married John Myers. She later married Dan Gunn, December 8, 1972, in Milan, Ill. Barb loved the outdoors. Survivors include her husband, Dan; children (spouses), Michael (Mary) Myers, Moline, Trae Myers, Moline, Mindy (Dan) Van Hoe, East Moline, Tacey (Rick) Keemle, Rock Island, Ryan (Tiffany) Gunn, Milan, and Regan (Ollie Clampet) Gunn, Moline; 11 grandchildren; a great-granddaughter; her brother, Jack Weime, Moline; sister, Cheryl (Mark) Dubbs, San Diego, Calif.; and best friend, Barb Kimpe, Bettendorf. She was preceded in death by her parents and brother, Don Weime. You brought happiness and tenderness to everyone you met. Your ambition was to marry and raise a family. I see you did both and I am sure they miss you dearly. I hope life was good for you and that you are still making people happy in Heaven…..